Do You Want To Share Your Story? When you share your story with even just one person, you will be making an impact in their life, and strengthening your faith at the same time. Here are some encouraging scriptures about speaking out for the truth. Psalm 66:16 Come and hear, all you who fear God; let me tell you what he has done for me. How can I be a competent witness for Christ in a lost world? How do I share my Christian testimony? The best way I can evangelize my friends and family without pushing them away? The Lord Came Into My Life! When you share your story, it encourages others in their faith by hearing what God has done in your life! I committed my life to Jesus Christ on June 25, 1986. That was the beginning of the end, and the start of better days to come, it was the last time I used drugs or alcohol. Many things lead up to that life-changing decision. I did not see fireworks or anything like that, but I knew in my heart and mind that the answer to my life was Jesus Christ. The Lord gave me back my life, so I decided that it was only right I lived my life for him. 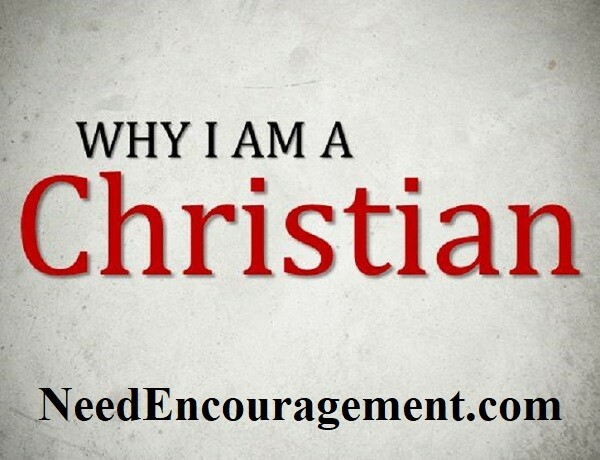 With all the help and encouragement that I was encouraged by Ron and Sue Sauer, I was inspired to startneedencouragement.com in 2007 to encourage others similarly. My relationship with Jesus Christ is significant to me because of all that God has taught me and saved me from, I have gotten into a good habit of starting each day in God’s word and journaling for many years now, I also have stayed active in Bible study and church for many years. I do not believe that just memorizing the Bible is what God wants from us (even though it is essential). But instead God wants a relationship with us, and that is what I have which I am so very thankful for. My life still is not anywhere near perfect, but I am far past where I used to be and striving forward to where God wants me to be more and more each day. 2 Corinthians 5:17 Therefore, if anyone is in Christ, the new creation has come: The old has gone, the new is here! Share Your Story And Your Faith! Do you know how to share your faith? If you would like to share your faith in a testimony, please contact us. How to share your faith? We All Have Our A Personal Testimonies! When sharing personal testimonies (or in other words your story), I would strongly advise that you outline it on paper, go over it by yourself or with someone you know before you share it. Here is my testimony how I lived before I met Christ, how I met Christ, and what Christ did in my life. Be sure that you are somewhat organized and your story is familiar to you and easy to understand and follow others who you are planning to share it with. How did things use to be? What personally made the difference in your life? What changed in your life? Try to share it like you are just talking with someone, try not to seem like you are just reading it off a piece of paper, but it that is the way you need to do it, that will work too. Remember that your story is your story and that nobody can argue with what you say because it happened to you which is why it is called your testimony. It is not you who is going to influence the person(s) you are speaking to, but it is the Holy Spirit that will be doing the work.